Edition wars aside: this book's a keeper. he last time I wrote about pencil-and-paper roleplaying games, I unintentionally ruffled a lot of feathers — apparently many gamers are just as passionate about their chosen rules set as I am about German automobiles. Let me preface this piece by saying that every gamemaster and group of players is different, and they should choose the rules and style of play that work best for them. That said, I've come to realize that certain rules sets do a better job than others of getting the concept of roleplaying across to players. A collection of numerical scores and abilities can only go so far when fleshing out a character and their environment. Experienced players may have an easy enough time integrating roleplaying into Wizards of the Coast's tabletop-heavy 4th Edition Dungeons & Dragons game, but what about new players and gamemasters? How is someone to know what roleplaying is if they've never experienced it firsthand? Regardless of the game you play, this guide's sage advice is invaluable.Recently, I picked up a copy of Paizo's GameMastery Guide for their Pathfinder roleplaying game. To say I was blown away would be the understatement of my gaming life — this is the tome I've been waiting for since I started gaming nearly twenty years ago. Sure, you'll find plenty of the rules, tables and charts which typically fill gamemaster's guides, but you'll also be treated to some of the best writings on running a campaign that I've ever had the privilege of reading. Dealing with troublesome players? Thrown for a loop by an unexpected player action? All these conundrums and more are addressed thoroughly throughout the GameMastery Guide's 320 pages. If you've ever wanted to start your own campaign but didn't quite know how, reading this book is a must. Like with every Paizo product I've purchased thus far, the GameMastery Guide's production quality is top notch and its writing is impeccable. The book opens by defining what the role of the gamemaster is — part storyteller, part referee, part host and all-around entertainer. We then receive a walkthrough of the basics, from the general flow of a gaming session to in-depth looks at adventure structures (linear vs. non-linear, for instance). In later chapters, the finer art of campaign creation is addressed, with helpful tips for fleshing out every aspect of your world's societies and landscapes. While the GameMastery Guide urges burgeoning gamemasters to start out small, it's always encouraging the creative soul to dream big. 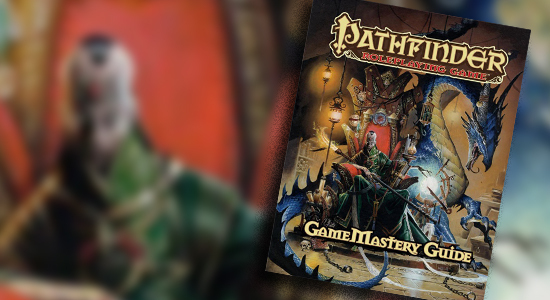 Paizo has excelled at looking back to gaming's past as they've fleshed out their various Pathfinder products, and the GameMastery Guide is no different. From a rules perspective, this game is as complicated or as simple as its players desire. Miniatures are always described as helpful but optional and rules deemed too complex by the gamemaster and players are best cast away. After all — rules exist solely to provide a framework and to give the illusion that the gamemaster himself is subject to the will of the dice. Lying about a die roll for the sake of story, excitement or fun? It's all just par for the course, and is talked about at length in the GameMastery Guide. We're now two years on and the 3.5 vs. 4th edition debate continues to create a stir in the Dungeons & Dragons community. While neither system is perfect, it's clear that Paizo has found a winning formula in its expanding collection of Pathfinder rulebooks. Regardless of the edition you bring to the table, I encourage you to pick up the GameMastery Guide — even casting its new rules aside, the sage advice is invaluable to any gamemaster. I'll go ahead and be uncharitable. After reading parts of the GameMastery Guide, I think that Paizo has driven a stake through the soulless, oversized rules index that is Wizards of the Coast's 4th Edition. Everything that defines roleplaying — imagination, pacing, continuity, camaraderie — is intelligently explored and explained. What motivates some players? How can a dull session be enlivened? Wizards couldn't be bothered: it's too busy stuffing pages full of talents cribbed from systems that belong on computers running billions of instructions per second. Paizo, on the other hand, looks to preserve, refine and enrich a modern pastime. I would disagree, the Dungeons & Dragons 4th Edition Dungeon Masters Guide is one of the best sources of GM advice for any game that I have read. It makes it clear that there are many different play styles, but makes sure not to imply one is better than another (there is no BADWRONGFUN to us an RPG.net meme). Its advice on how to pitch a campaign to players and how to structure games is so good I have even quoted it in threads discussing the merits of Call of Cthulhu versus Trail of Cthulhu! 4th Edition D&D isn't perfect, and I probably still prefer 3.5 but I wish Paizo had been bolder and made some of the changes Wizards of the Coast did with 4th edition. It sounds nice, and I'd love to take a look at it sometime. I just wish Pathfinder wasn't built on 3.5 - I burned out on that pretty hard when I was running the Shackled City adventure path, which we eventually abandoned because I was no longer interested in running it.